When LeBron James made a game winning driving basket against the Orlando Magic Wednesday, his first game winning shot in two and a half years with the Miami Heat, ESPN devoted much of its SportsCenter highlight show to the milestone. There’s also believed to be a 30 for 30 documentary about the shot coming and reaction being sought from Bill Russell and President Obama. On Friday, Bulls shooting guard Marco Belinelli made his third game winning shot in the last two months, a three pointer with 5.9 seconds left to defeat the Utah Jazz 89-88. ESPN research is believed to be working on finding out who Belinelli is. And continuing to make the case for who should be the Bulls’ shooting guard of the future. That’s what that position is about, being ready to take the shot no matter how many and when you may have missed before and not running away from the moment even if they still don’t know your name. It was a vital win for the Bulls to move to 35-27 even if making the playoffs is not a question. With both Toronto and Philadelphia sliding the Bulls are more than 10 games up on the ninth and 10th spots with 20 games left. The Bulls are fifth in the Eastern Conference under a blanket with four teams separated by a game and a half. The Bulls are three and a half games ahead of eighth place Milwaukee to avoid streaking Miami in the first round of the playoffs. The Bulls now head west to play the also streaking Lakers Sunday on national ABC TV in the start of a three-game trip and the next five games against Western Conference opponents before the final game with the Central leading Pacers March 23. So it remains a rough road with Richard Hamilton, Taj Gibson and Kirk Hinrich out, which depletes the Bulls offensive abilities. In the last month, the Bulls have reached 100 points just once, and that against lowly Charlotte. The Lakers average almost 103 points per game, and, sorry ABC, no Derrick Rose. Rose is expected to make the trip to continue his rehabilitation, and you figure the NBA for scheduling rare Bulls Western Conference games in March and ABC for the feature television time figured Rose would be back. There were reports on ESPN that Rose has been cleared by team doctors to play. Though the Bulls and Rose always have made it clear he had to feel strong and healthy. On the TNT broadcast of the Bulls game last week, David Aldridge reported Rose told him he still was feeling pain. Rose also has had trouble landing after dunks, which suggests there’s a difference between a successful surgery and the successful health of a patient. The Bulls always have made clear they do not believe you question a player when he says he is hurt or not ready. So Rose will continue to work with no timetable on a potential return. The Bulls generally finish all their Western Conference road games before the All-Star break with their two long road trips. But this season was different. And though the NBA will deny it, the league schedules to anticipate such possibilities. It seems obvious they were working around a potential Rose return with two more Miami games left for the Bulls and the schedule broken up like rarely before with three separate trips into Texas when they usually do the Texas games in one or two trips. But the Bulls continue to bounce back when it seems unlikely while Utah’s tenuous hold on the last playoff spot slipped even more as they fell to 32-30 and now just a half game ahead of the ninth place Lakers. To NBA infinity and beyond, which is the NBA buzz for being out of the playoffs and headed to places if known are not particularly welcoming. Al Jefferson led the Jazz with 23 points, including a 19-footer with 51.6 seconds left to give Utah an 88-86 lead. The Bulls then and again continued to be determined if not that efficient. They ended up shooting 37 percent for the game, including 23.8 percent in the second half and 20.8 percent in the fourth quarter. And, yes, won. And after Jefferson’s shot to put the Jazz ahead. Belinelli missed coming out of a timeout with 43.9 seconds left as the play was directed for him. Noah rebounded and looked like he was going back up for the tie when Derrick Favors blocked his shot. Favors had 11 points and 10 rebounds off the bench while young backup center Enes Kanter had 10 points in 17 minutes. And you wonder what the Jazz is thinking. They keep going to Jefferson, who is good, but clearly not in the future plans. So Favors and Kanter impress, yet are used sparingly for a team going nowhere and running the risk then of alienating its young players. Look, it’s not like players are lining up to go to Salt Lake City. So the Jazz continue to focus around a player not likely to be with them next season at the expense of their developing future. Lucky they’re not the Lakers and what a time ESPN would have second guessing them. The Jazz then went back to Jefferson, who is the best player perhaps in league history who cannot jump over an earthworm. He’s a clever, strong post player with classic inside moves and nice range to 20 feet. But you have to play slow with him and if you go for his pump fake you should be fined. Noah did a nice job mostly ignoring it. There was 20.8 seconds left when Jefferson fired again, and making it would likely have ended the game with the Jazz already up two. 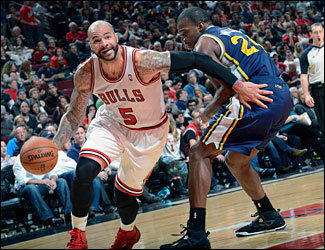 But Jefferson came up short and Boozer completed his double-double with his 10th rebound. The Bulls went back to Belinelli, who was playing point guard down the stretch as he’s basically done since Hinrich went out, this time with Butler as shooting guard. With Hamilton still out with back problems and now into the final 20 games you could see Belinelli finishing the season as a starter to help preserve Hamilton and take advantage of Belinelli’s improving and clutch play. Thibodeau doesn’t like to change starters, but the time may be right. Belinelli previously had game winners with an amazing falling down shot against the Celtics and after that fabulous out of bounds save by Noah against the Pistons. He gets in the right spot and doesn’t hesitate. Though Belinelli isn’t a great defender, Thibodeau came up with a nice backcourt crossmatch which I thought was crucial to victory. Belinelli and Butler cross matched on defense as Butler is the superior defender. Butler did a strong job on the dangerous Mo Williams, holding him scoreless on one shot with two turnovers in the fourth quarter which, as much as anything, saved the game for the Bulls. It’s a luxury to have a shooting guard who doesn’t shoot much, though the Bulls way of winning with all the injuries is basically whatever works. Belinelli missed a short shot with 13.9 seconds left. But Noah dug the rebound out and handed it to Butler in the lane. Butler made a heck of a play reminiscent of Boozer’s pass to C.J. Watson against Miami last season that led to an overtime win. Butler looked about to try to go up against the citadel of Utah’s interior defense with a step through when he gathered and with a crow hop looked left and with a cross court pass found Belinelli who stepped back a few inches and made the three. “It wasn’t the way they drew it up. He hit a tough shot,” said Jefferson. The Bulls got 50 rebounds, though the Jazz dominated inside scoring with Jefferson and got a rare double-double from Marvin Williams, who’d recently been benched after a series of scoreless games and apparent difficulty coming out of a hypnotic trance. But it was the Bulls battling for the extra play, which also got them 30 free throws and 25 points from the line to offset the continued crooked shooting with only Belinelli not below 50 percent. The Jazz had one last attempt, but Gordon Hayward sort of pushing off in that Jordan-against-Jazz 1998 style missed a 15 footer and Butler went high to grab the final rebound and escape. The Bulls got off to an unusually good start with a 55-46 halftime lead with Boozer with 14 points and Robinson and Belinelli 10 each. Unlike against the Spurs, Boozer was turning and going hard to the basket. Though he always says he has little feeling toward the Jazz anymore because everyone he played with is gone, you always can tell he wants to do well given the fans’ generally hostile reaction toward him. But after halftime, the Bulls stumbled as the Jazz pulled within 72-70 after three quarters as they worked to Jefferson again. Boozer had a nice spin move for a three point play to break one Bulls scoring drought, but Noah got in early foul trouble and in a sign of things to come Belinelli closed the quarter to retain the lead with a nice floater. The Jazz pulled ahead by five about five minutes into the fourth as Favors and Kanter were proving too quick inside. But Belinelli put the Bulls back ahead with a three at 84-83 with 5:03 left as Belinelli crouched into a shortstop-going-into-a-basketball-defensive stance for a little English on the ball. Though since he is Italian perhaps it was a little Tuscana. The Jazz continued to try to ride Jefferson, who had another 18 footer before his final 18 footer with 51 seconds left. But the Bulls, well practiced with all their misses, kept pounding the boards with nine fourth quarter offensive rebounds, five by Noah, and someone who finally could make a shot. Bella Ciao was a famous resistance song in Italy in World War II. 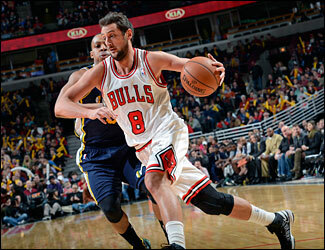 Belinelli is becoming a famous figure to help the Bulls resist last second losses.